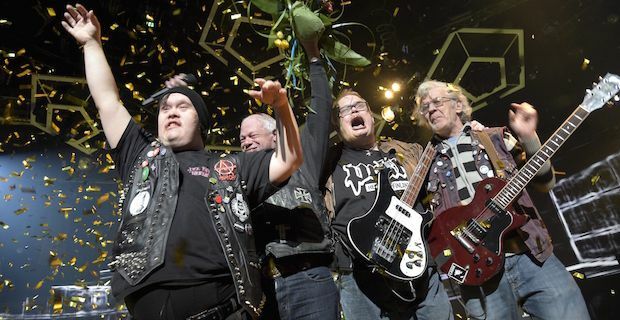 Finnish punk group Pertti Kurikan Nimipäivät have won Finland's national song contest and have earned the right to represent their country in Eurovision 2015. Not only will the group be the first punk band to compete in Eurovision but they will also be the first band made up of members with learning disabilities. Band members Kari Aalto, Toni Välitalo, Sami Helle and Pertti Kurikk could not hide their delight at getting the nod to compete with Europe's elite. They beat out the rest of the competition with their 1 and a half minute song Aina Mun Pitaa which translates as I Always Have To which they will now perform in Vienna. The band members all have autism or Down's Syndrome and have previously starred in their own documentary called The Punk Syndrome back in 2012. Aalto encouraged people with learning disabilities to express themselves saying "Every person with a disability ought to be braver. He or she should themselves say what they want and do not want." Helle tried to explain what the band are aiming to do while also insisting people should not feel pity for the group saying "We are changing attitudes somewhat, a lot of people are coming to our gigs and we have a lot of fans." He added "We don't want people to vote for us to feel sorry for us, we are not that different from everybody else, just normal guys with a mental handicap." The group getting to play on the big stage of Eurovision 2015 is a dream fort the band who are looking to raise awareness for mental health across Europe. Finland has had success in the pan-European competition previously with heavy metal band Lordi triumphing in 2006.